The Vineyard Sound stands between Islanders and the home campuses of every university and community college in the state of Massachusetts. Getting to and from the Island is a challenge that can stop adults here from pursuing their education, and local businesses can have a hard time finding employees with the skills they need. Adult & Community Education of Martha’s Vineyard (ACE MV) works to bridge the gap between Island workers, businesses, and the skills they need to learn. “Our motto is, ‘Learn Local,’” says Sam Hart, Executive Director of ACE MV. 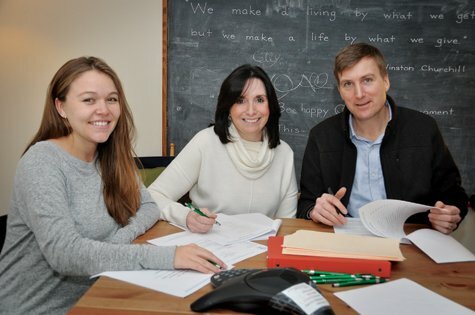 “By taking classes locally, people can develop face-to-face relationships that carry on into their professional lives, building networks and trust.” The small office staff at ACE coordinates an impressive network connecting businesses, students, and educational institutions. It works with the local public school system, Cape Cod Community College, Bristol Community College, the UMass Extension turf program, and Fitchburg State University. At the beginning of 2016, twenty-one local students began an M. Ed. Program through ACE MV and Fitchburg State University. That cohort was very successful, and the program is being offered again starting in January 2019. Another upcoming program is a two-year Offshore Wind Technician training program, which will begin this spring with a class in green technology. It will train 28 to 40 local people to work on the offshore wind farm being built 14 miles off the coast by Vineyard Wind, partnered with Vineyard Power Coop, and is open to high school juniors and seniors as well as adults. Some programs are ongoing, responding to consistent needs in the community, like the demand for business skills. Jeannine Lenehan, who became ACE’s program director in the fall of 2017, developed the one-year business program that began this past fall. “It’s a very diverse population in the classroom,” Jeannine says. “It’s fun to see the groups come together.” She says that many of the students are looking to start their own businesses. She has also worked to improve enrichment classes. For the existing language courses, this meant identifying the needs of the community more clearly. “We designed Spanish and Portuguese classes that focus on the skills needed for everyday tasks, like a trip to the bank, a trip to the hospital, and a trip to the grocery store. It’s not just a conversational class,” she says, noting that attendance has improved dramatically as the classes have become better tailored to meet specific local needs. “One of my goals was to define and meet certain objectives,” Jeannine says. “What is the goal of each of these courses? Each of our instructors produces a syllabus and a series of lesson plans.” She helps coach new instructors as needed, and has brought all of ACE’s teachers together for a teacher orientation night. “The impetus was that the majority of our teachers didn’t realize the wide range of courses that we offer. Everybody has a different experience with adult learning that they could share to help enhance each of the programs,” Jeannine says. “It was a big kumbaya moment,” Sam says. ACE offers HiSET (high school equivalency test) classes at the Boys and Girls Club of Martha’s Vineyard. It’s a neutral setting to accommodate students who might have left the high school with negative feelings. There’s also an adult literacy program that offers free one-on-one tutoring in reading skills. Enrichment classes in Food, Arts, and Island Living continue. In another new development, the Martha’s Vineyard Women’s Association chose ACE MV to take over its assets and continue its mission through a new program called Women Empowered through Continuing Education. Through it, ACE MV will offer assistance with tuition, transportation, and childcare to help reduce the barriers facing women and girls. “We are a very small organization but we are pretty mighty,” Jeannine says. “We have wonderful instructors and I have been able to channel their experience in a way that helps build our program.” With its ever-expanding array of classes and training programs, ACE MV is a great resource for the Vineyard community, building relationships and skills to enhance the Island’s culture and economic health.